Professional Baking: Week Four – Pastry! 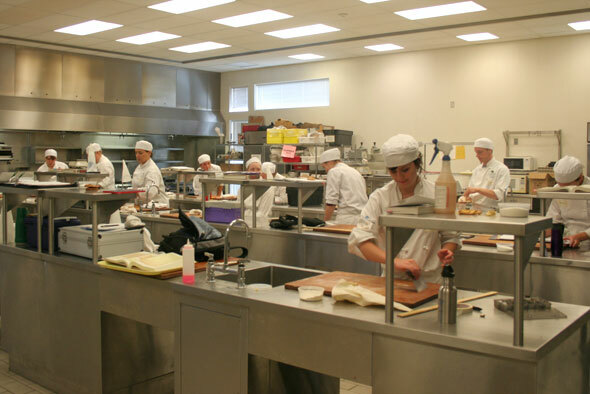 Another week of Professional Baking School at VIU and this time we turn our focus on pastry with Chef Harper. Again, a bit intense as we’re really just learning the very basics so I have minimal photos. Still, a glimpse of the space and class are available. Here we are in the Food Lab with individual work stations and (off on the sides) cooking elements, stoves, etc. All very high tech. The stove top elements in the Lab are induction and are wonderful to work on. Watch a video explaining how they work here. Note how fast the water in the pot boils! And you can put your hand on the element without burning yourself – the heat is ‘created’ in the pan itself. Amazing. Why these aren’t in every kitchen already, I do not understand. SOOOO much better than annoying ceramic/glass tops that are either on full blast or off. OK, on to the class itself. 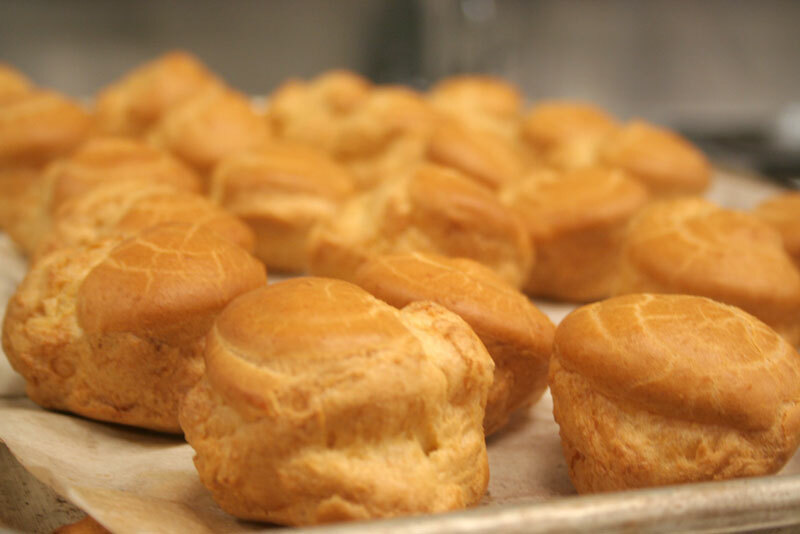 Bavarian Crème was used to fill little puff pastry balls we made from the Choux Paste, the latter being an exercise in piping consistent sized balls of the paste. These were later drizzled with chocolate. The Diplomat Crème was made using Pastry Cream mixed with whipped cream, gelatin and raspberry purée and poured into small cups. Much like a mousse. We cooked sugar and water to the point of burning, taking little samples of the syrup as it heated up to see what sugar syrup colour/temp we would want to achieve before it became rather bitter. Surprisingly, it needed to be just light golden yellow to be a nice flavour, and very quickly started to become bitter at the light caramel point. Darker was very bitter and inedible. Clear or nearly so had almost no flavour. Pro Tips: burnt sugar will stink up your house; even very burnt sugar is easily washed off dishes by giving it a long soak in water. On the cookie side: We made sugar cookie dough which we later rolled out and baked, according to what Chef showed once but without any further instructions (temp, actual thickness, time, etc.). I failed: mine were too thin and not baked long enough. Many folk got it spot on, though. 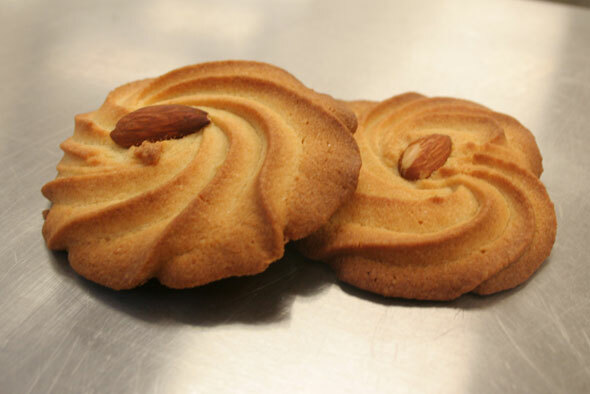 Spritz Cookies are piped cookies, made in part using almond paste. 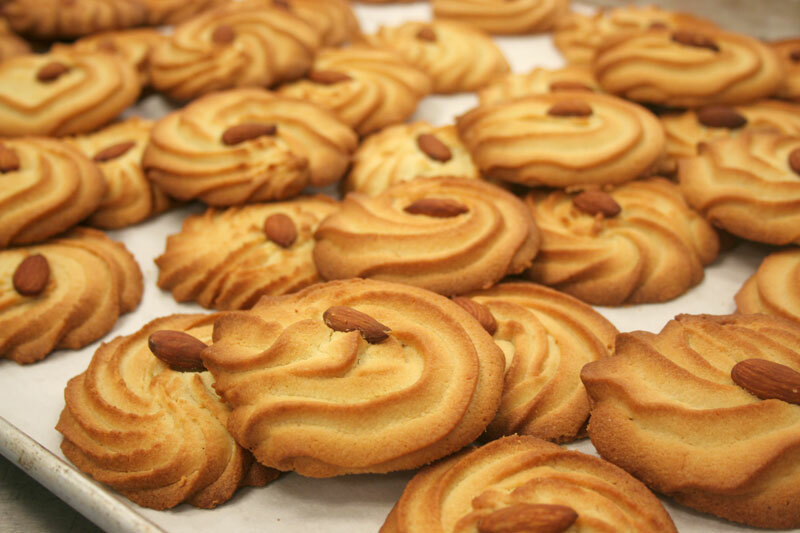 Again, the goal here was piping technique to emulate the sample shown, as it would be in a “real life” bakery situation: “Here’s the cookie we want, make 500 exactly like it!” In such a situation, you do not want much variance; they all need to be just as tall and wide as the sample. Too big or short means they won’t cook right and the final count will be off. It took several goes – fortunately, you can scrape off the failed ones and re-pipe them – but I eventually got some nice looking ones. Above, a shot of a couple of them. In fact, lots of people’s cookies came out really well. Nice job, everyone! Back in the bakery for the last day, we baked off some of our goods, packaged and set out for sale the cookies and puff pastry. Lauren and I also got to stack a couple of big cakes for a special order – no pics again. But here we are anyway, just to close out the post. Plus: Mr B asked for a Saturday (Oct 1) volunteer to get some items baked out for a special event. Not sure what we’ll be handling but I stepped up for that. Making dozens and dozens of one thing is excellent practice, since you can improve your technique as you go. So much better than just three at a time like at home.